Is capitalism fuelling the war on drugs? 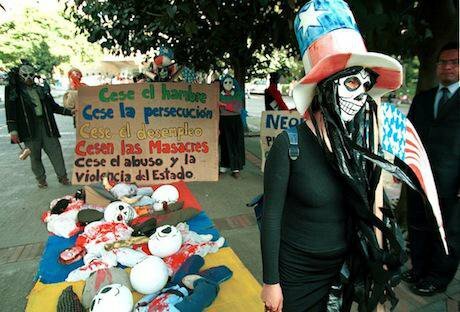 Protest against Plan Colombia, 2001, Bogota. Getty Images / Carlos Villalon. All rights reserved. “This is a policy of the government: to clear us off the territory that is ours, as campesinos and indigenous peoples, because there are many indigenous communities who have their lands taken away by war, by the terror that they instill in the communities to remove us from our territory so that they can come and extract natural resources” – Fernando Roa, farmer and vice president of Santo Domingo’s communal action council. openDemocracy: The way we talk about the ‘war on drugs’ seems to extend from endless debates around prohibition and decriminalisation in policy circles, all the way down to the lurid stories of narcos and cartel violence, which fill the shelves of airport bookshops. But Fernando Roa suggests that there is another, deeper dynamic at play here – what’s the story we are missing out? Dawn Paley: My book Drug War Capitalism proposes a break with official discourse on the US-backed drug wars in Mexico, central America and Colombia. I interviewed Fernando Roa and others from his community in Arauca, Colombia, in early 2014. In the book, voices like theirs are brought to life and contrast with a narrative that some of us are more familiar with – the official version of the war on drugs. My aim was to try and formulate a people-centred critique of the US-backed war on drugs, which locates this war in the broader context of capitalism and US hegemony in the hemisphere. So the book is really about opening up a new narrative to talk about the war on drugs in the Americas. When we talk about Plan Colombia or the Merida Initiative or the Central American Security Initiative, or now, the Alliance for Prosperity in Guatemala, El Salvador and Honduras, it doesn’t make sense to talk about the success or failure of these programmes in terms of drug production and trafficking. Rather, it is worth considering the war on drugs as falling on a spectrum of US wars abroad. In war-making more generally, US interests are about ensuring control over segments of territory and over communities, the movement of people, and social relations that challenge US hegemony. And I think we can see similar dynamics at work in the war on drugs. openDemocracy: So can you briefly explain the dynamics that drive ‘drug war capitalism’ – how has resource extraction intersected with anti-drug trafficking operations across Latin America, and how does it continue to do so to this day? Dawn Paley: That’s exactly it. This is not necessarily about how drug cartels or drug traffickers or paramilitaries or whatever you would like to call them interact with the corporate sector. It is about how state policies lead to violence, terror and displacement, coming under the discourse of an anti-narcotics fight. I argue that these terrifying forms of violence can positively impact the business climate, in favour of transnational capital. When I talk about the book with groups in the US, I usually talk about the three Ps of the war on drugs: policy, police and paramilitaries, and I think we could add a fourth, prisons. Consider policy. One of the key innovations of Plan Colombia was to carry out a transformation of the legal system and a series of policy reforms to encourage foreign investment and to prepare Colombia for the signing of the US-Colombia Free Trade Agreement. These policy elements appear to have little to do with the war on drugs – the further neoliberalisation of host economies – but in fact they were explicitly part of Plan Colombia, though that was not admitted until much later. Mexico has also seen a legal system reform under the Merida Initiative and there have been far reaching reforms to the energy sector, the telecommunications sector, to labour, education, financial and tax laws, since 2006. Policing is a key avenue of US influence and spending in these wars. In Mexico, the number of federal police climbed from around 4,000 before president Felipe Calderón launched the drug war in 2006, to over 40,000. These forces are highly militarised. A recent study showed that where they were deployed in combination with soldiers, the homicide rate rose. The official story is that this is a new, uncorrupt force that can fight drug trafficking. However, like elsewhere, the presence of federal police has meant more violence, and a shift in drug trafficking routes. The language of the Merida Initiative itself is interesting – the goal of Mexican authorities is supposedly to disrupt trafficking routes – which means, obviously, they move elsewhere. And that’s where the third P comes in, for paramilitary. Violence in Mexico experienced a severe uptick in December 2006, when Calderón declared war against organised crime. The strategy was disruption, disruption of a decades-old (at least) business of moving cocaine and the much older businesses of producing and moving opium and marijuana north. Attempts by certain parts of the state repressive apparatus, like the marines, the army and the rebranded federal police to disrupt the movement and production of narcotics provoked escalating violence in response. Trafficking groups armed themselves to the teeth and began using new tactics to defend and to claim their territory. Their tactics are based on the use of terror against the population. But these groups are not inherently in conflict with the state, and that’s why I think the notion of drug cartels is misleading: many of these groups are made up of state forces or former state forces, and their links of cooperation are strong. By way of example, municipal police officers in Guerrero didn’t turn the 43 students they arrested in September 2014, over to a drug gang. They turned them over to a paramilitary group, whose members were also police officers. Drug cartels are not insurgent forces. As we see, time and again, their members often come from government ranks, and their activities can actually benefit or be useful to capital. This is where the hindsight we have from Colombia comes in. In Colombia, we know that drug-financed paramilitary groups patrolled with the army, they supported congress-people, they eliminated union members and cleared territory for transnational corporations like Chiquita, Dole, Coca Cola, BP, Drummond, and so on. Finally, the US has, through the Merida Initiative, invested in expanding Mexico’s prison system. It’s a scary reality, that Mexico is increasingly following the US model for their prison system. openDemocracy: A major part of your book Drug War Capitalism hinges on an economic analysis of the war on drugs that places a major emphasis on the role of the international private sector, especially extractive industries. The most violent drug war has been in Colombia, which is not a major oil producer. Drugs and oil do come together in a big way in Mexico, of course. But why do you think this is a causal relationship, rather than a symptom of how weak and corrupt governance has become? Dawn Paley: I don’t think of Mexico or Colombia as being countries with weak states. These are incredibly powerful states, with strong repressive apparatuses. In Mexico, the reach of the state through all kinds of programmes (and also through coercive violence), and the clientelism of political parties, is incredibly sophisticated. Mexico is far from a failed state. It is a great macroeconomic success story, according to the international finance institutions. And what prohibition does, and what the war against drugs does, is augment the repressive capacities of these states to a degree that would be otherwise hard to imagine. If the violence in Mexico can be understood as a symptom of anything, it is as a symptom of capitalism. Violence is integral to capitalism and capitalist expansion. Karl Marx wrote about this in the mid-1800s, and it continues to be true today. As for the economic analysis, my starting place is that wherever there are important deposits of natural resources, there exists the potential for local, community resistance to the development of the extractive industries. The so-called war on drugs, which I consider to be a war on the people, provides a convenient mantle for killings, disappearances and physical intimidation of those who are or who could take part in resistance movements. In some places, community members have overtly spoken out about militarisation and the pressure they face from organised crime and state forces to allow the extractive industries onto their territory, as in Chihuahua, Michoacán, and Guerrero. In other places, the voices of resistance and movements are not as outspoken. For example, if you take a map that shows us some of the most violent states in Mexico right now, with high levels of disappearances and high levels of killings and displacements, it lines up almost perfectly with a map of Mexico’s main energy reserves, from around the Laredo, Texas area east and down along the cost of Veracruz state. Stratfor and other think-tanks, the Mexican government, and the US government tell us over and over again that the violence is about Los Zetas and their beef with the Gulf Cartel along the Gulf of Mexico. But that leaves out some really important players, and again, if we think about events in Mexico as falling on the spectrum of US wars more generally, we see in Mexico, as elsewhere, that big oil and gas, and all of the other industries go along with these war efforts. I think we can apply a similar analysis to understand high levels of violence in key urban areas that are home to people who provide labour for low-wage manufacturing (the infamous maquilas). Here, one barrier, as David Harvey would say, to capital accumulation is the potential of a strike by workers. And so I think part of the terror that has been lived over the past 10 years by people in border communities like Ciudad Juarez and Piedras Negras and Nuevo Laredo and elsewhere, has possibly as much to do with keeping workers in line as it has to do with drug flows. But the most common way the drug war is talked about in the media or by police or state officials or think-tanks invisibilises the day-to-day life of people in impacted areas, and it ignores the flows of capital too. People talk about fights between cartels for control of a ‘plaza’ – as if a plaza was an empty place, as if there were no one beyond drug cartels. So it’s worthwhile, I think, to start to see who and what else is operating in these areas impacted by violence related to the war on drugs – Walmart Superstores or Foxconn assembly plants, Goldcorp mines or Halliburton facilities, big dam projects, border crossings or migrant trails, community police or grassroots organisations, and often a combination of municipal, state, and federal police, gendarmerie, soldiers, and sometimes marines. Once we bring in all the actors we create a fuller picture of the war, and yes, in some places over time, we are talking about recognisable scenes of war, with gun battles and car bombs, massive prison killings, mass kidnappings and home invasions by state forces, and so on. I propose that we reassess the drug war in Mexico and elsewhere in all of its complexity, to the extent that we are able. Things become extremely complicated, obviously. But one thing we see generally is that big capital tends not to be negatively affected, that terror rules for the population at large, and that these destinations remain choice destinations for foreign direct investment. These are countries where security exists for transnational capital, for high officials, and not necessarily for anyone else. openDemocracy: Within the US, there has been an increasingly visible lack of confidence in prohibitionist domestic policy. Can you unpick this contradiction between the United States’ conflicting domestic and foreign policy, and is it changing? Dawn Paley: Certainly, the marijuana initiatives in US states are important. But I don’t think that legalising pot for medical or recreational use truly undermines prohibition. There would need to be a serious discussion about the decriminalisation of cocaine, opium, meth, and other substances in order to get to a place where ending prohibition becomes a reality. I think prohibition is incredibly useful for state-making. Quite recently, Juan Orlando Hernández, the president of Honduras, came to the US, and he gave a talk at the Brookings Institute. And I thought what he said there was really interesting in terms of understanding just how useful the discourse of prohibition can be for governments. President Hernández made this point where he said that in the US, drug policy is a matter of public health, whereas in Honduras it is a matter of life or death. In this way, he essentially validated US drug policy domestically as humane. He ignored the criminalising aspect of the US drug war, the house raids, the hundreds of thousands of people, mostly people of colour, imprisoned or on probation in the US because of prohibition. But in his remarks, president Hernández also blamed corruption and impunity in Honduras on drug trafficking. Anyone who follows Honduras knows that there is no single source for impunity there: crimes from the 1980s remain uninvestigated, and the 2009 coup d’état, of which Hernandez is a sort of heir, had little to do with the drug trade, and it was a stunning example of the corruption and impunity of Honduran elites. But it’s as if prohibition gives states a sort of trump card. So the government of Honduras will look that way on the criminalisation of people of colour (including, of course, Hondurans) in the US. And in return, Honduras will ask the US to look the other way on massive state corruption in Honduras. The drug war discourse is a shield for both governments, and I think this is one way of understanding the usefulness of prohibition today. All this is to say that the discourse of the war on drugs and the existence of prohibition is incredibly useful when it comes to state formation and government attempts to exercise violent forms of social control, while making it seem like they’re helping people. openDemocracy: So we are coming up to a Special Session of the General Assembly of the United Nations, held on the topic of drugs – UNGASS 2016. If this is a historic opportunity to transform the international drug control system, what are the debates we should be holding now? Dawn Paley: I think fighting prohibition is an important way of attacking and undermining the drug war, which is an illegitimate war in the US and anywhere else it is being fought. In terms of the drug war south of the US border, there is a Caravan of activists and victims coming up from Central America and Mexico to be in New York during UNGASS. So I’m sure they’ll provoke important discussions and bring key points to the table. In terms of the movements and debates I think are crucial today in the US and elsewhere, here’s a short list: the struggles for prison abolition, for disbanding and disarming police, for an end to prohibition, towards immigration status for all, and struggles against capitalism and state violence. I hope that these positions and these struggles are present in the debates in the lead up to UNGASS.